Lost Windows password on your HP Elitebook laptop? Is there a way to remove BIOS password after forgotten? How to factory restore HP Elitebook? In this article we'll show you how to unlock your HP Elitebook laptop by clearing BIOS password, resetting Windows admin password or restore your computer to factory settings. How to remove or clear a forgotten BIOS password? You can reset all BIOS settings (including the BIOS admin/user password) by changing the jumper settings, or removing the CMOS battery from the motherboard for a few moments and then putting it back in. But in all new UEFI-based HP notebooks, there is a built-in utility named HP SpareKey, which can help you recover lost system passwords, such as the power-on, drive lock, or BIOS passwords. When setting up the SpareKey, you are prompted to provide answers for a sequence of three predetermined personal identification questions. Turn on the computer and immediately press the ESC key to display the Startup Menu, and then press the F10 to enter BIOS Setup. After typing the incorrect BIOS password three times, you'll be presented with the screen prompting you to press F7 for HP SpareKey Recovery. Press F7 key, the HP SpareKey wizard pops up and prompts you for the answers to the three personal identification questions. If you successfully answer the questions, you are granted access and you can reset the BIOS password. Note: HP SpareKey cannot help you recover a Windows 8/7/Vista administrator account password. It is intended solely to recover system-level passwords. If you've lost your Windows user password, you may not have to reset your laptop to factory settings. 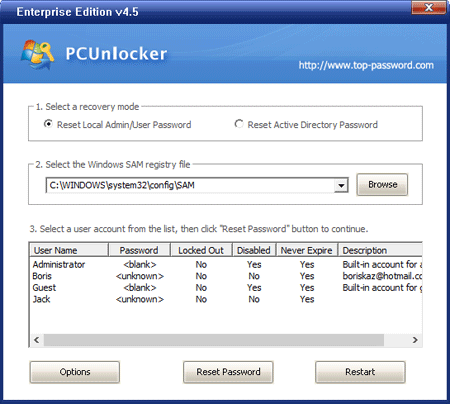 With PCUnlocker you can reset forgotten Windows 8/7/Vista password on HP Elitebook laptop. No need to worry about data loss! Download the self-extracting Zip file of PCUnlocker package. Decompress the package, there is a ISO image: pcunlocker.iso. Burn it onto a CD or USB flash drive. Turn on your HP Elitebook laptop, and then press and hold the ESC key to access Startup Menu. Press F9 to enter Boot Device Options and then boot to your CD or USB drive. Wait until the boot process is finished. When a window pops up with all your Windows accounts, select the admin account and click on Reset Password button. The program will unlock / reset your forgotten administrator password immediately. Factory reset will remove everything from your PC. Before restoring HP Elitebook to factory settings, be sure take backups of your important files like pictures, videos, music etc and store them safely like another machine or USB device etc. Turn on or restart HP Elitebook, and then press ESC key while the "Press the ESC key for Startup Menu" message is displayed at the bottom of the screen. Press F10 to enter BIOS Setup. Use a pointing device or the arrow keys to select File -> Restore defaults. To save your changes and exit, click the Save icon in the lower-left corner of the screen, and then follow the on-screen instructions. Your changes go into effect when your HP Elitebook laptop restarts.